Meet the ten past Fire Chiefs of the Stamford Fire Department. Chief George Bowman, the first Fire Chief of the Stamford Fire Department, served as Fire Chief for sixteen years. Chief Bowman, who had shown talent for effectively managing the Fire Department, was then also chosen as the first Chief of Police. He was appointed Police Chief on May 7, 1894 as he retained the two offices – Chief of Police Department and Chief of Fire Department – until his death, September 14, 1903. 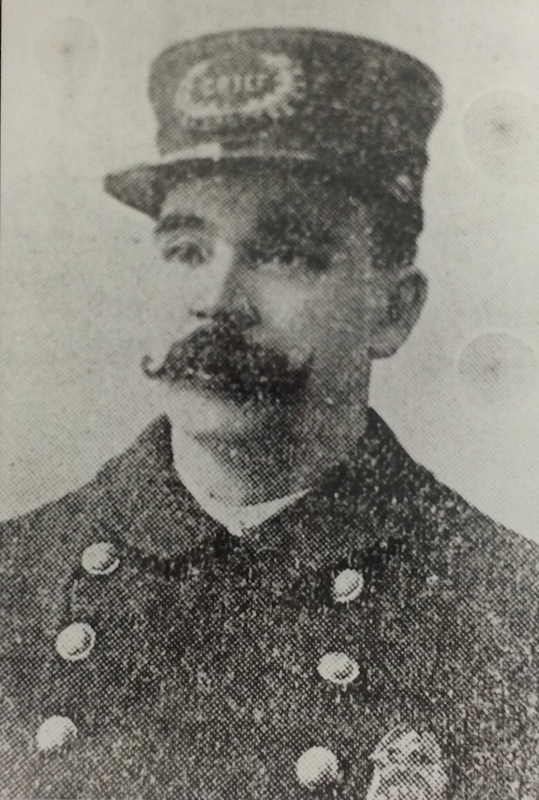 Appointed as Stamford first Fire “Call” Chief (1887). Borough streets get paved (1889). St Johns Episcopal Church burned to the ground due to water problems. Stamford’s second American LaFrance Steam Pumper acquired (1892). Stamford officially becomes a “City” (1893). Firefighter Owen McMahon, driver of one of the hose carriages, killed after being thrown from the apparatus and being struck by a car (1896). Established a new South End Fire Station (1899). Captain Z R Horton killed while responding to an alarm by falling from Truck #1 and being run over by its wheels (1900). Assistant Chief M J Mullen died due to an illness contracted after fighting a fire in freezing temperatures. Chief Harry W Parker submitted his resignation on May 24, asking to be placed on the retired list. The request was granted by the Stamford Board of Alderman on June 1. Chief Parker left the Fire Department after 38 years of service. He was retired on half pay ($1,500 annually). Chief Parker served 10 years longer than was required by the rules governing retirement at that time. Stamford’s first permanent Fire Chief. Opera House Fire (December 1904). Purchased the Department’s first combination hose and chemical wagon (1905). The Gamewell Fire Alarm System was significantly updated (1906-1916). Purchase of an Amoskeag Steam Engine (1906). The first motorized Locomotive Engine was purchased (1910). The first motorized American LaFrance Ariel Ladder Trick was acquired. Opened the new Central Fire Station on Main Street, next door to the present day Central Fire Station (1915). Established the “two platoon” work schedule (1919). Firefighter Oscar Sphar died of a massive heart attack at the scene of a fire. “When I started, call men received the vast sum of $12.00 per year. If one of these men didn’t show up for a blaze he was fined $1.00,” said Chief Veit. Purchased Engine 4, an American LaFrance triple combination hose, pumper and chemical Engine (1922). Construction of a modern drill tower, directly in back of Central Fire Station. A machine shop was built in Station #1. Firefighter Thomas Meehan died after being thrown from the apparatus when it collided with another vehicle (1945). A new 600-gallon triple combination engine was purchased for Station #2 (1937). A new 1000 GPM Ahrens-Fox paper was purchased for Station #2, but it was too wide for the doors, so it was assigned to Central (1938). The 56 hour “Short Work Week” was started (1950). A new two-way radio system was established (1954). Chief Thomas Richardson submitted his request for retirement after 43 years of service. Station #2’s front was changed from three doors to two doors to accommodate modern day apparatus (1954). Started using the old incinerator grounds as a “drill field” (1954). The Fire Prevention Division was officially established (1955). Station #4 at 364 Shippan Avenue and Station #5 on Washington Blvd. were opened (1955). Captain George Daily died of a head injury sustained while performing rescue operations during hurricane (1956). Firefighter Henry Wozniak died of a heart attack while on duty (1973). Four children die in fire at 85 Pressprich Street (1969). Ground was broken for a new “Central Fire Station next door to the current Central Fire Station (1971). Ground was broken for a new Fire Training Facility on Magee Avenue (1972). Stamford’s first tele-squirt was put into service. United Organics Fire / Explosion seriously injuries three Stamford firefighters (1983). Worked with city personnel department to assure continued high standards in recruitment that provided equal opportunity for all prospects. State passed improved automatic sprinkler regulations after our departments input following tragic death in a senior housing/nursing facility that was not fully protected. Automatic Cardiac Defibrillators purchased and put on engine companies. First patient was a city board of representative’s member in city hall who had gone into full arrest and was revived by fire department crew in the board meeting hall after being declared dead by a Dr. Yes, this representative did vote in favor of funding the purchase of the AEDs. Assigned SFR units to operate from “volunteer” stations due to shortage of volunteers at those stations. Drafted proposed changes for City Charter for citywide fire protection services which reflected the values of both volunteer and career staffs. Most of proposed changes finally passed in a City Charter change election by all city residents 20 years later in 2013. Purchased Tower Ladder to increase master stream water flow. Began search for new south end fire station by meeting with property owners and companies in the area to seek donation of site for a new station. Encouraged TEAM members to seek additional training outside of the department including at the National Fire Academy. Involved TEAM members in budget preparation and in development of specifications for apparatus and equipment. Team members began testing a variety of equipment to determine which would best suit the needs of SFR. Acquired the property for the new Station #2 from Pitney Bowes for no cost to the City. Acquired the Department’s first Thermal Imaging Camera through donations made to a Safety Foundation. Assigned the Haz Mat and Rescue Companies to Stations 2 and 5, respectively. Developed several public safety programs, including “Are Your Numbers Up”, “Fire Victims Help” and the first ever “Carbon Monoxide Safety Seminar”. Certified CPR Instructors / Firefighters provided CPR training to corporations and organizations. Firefighter William Miller of Engine Company #4 died of illness he contracted during the performance of his duties. Former fashion executive loses three daughters and her parents in a tragic Christmas Day 2011 fire.